Quilt Patchwork *Time Travelling*/ Tutorial ~ DIY Tutorial Ideas! Based on fabrics with a usable width of 107cm (42in). 1. 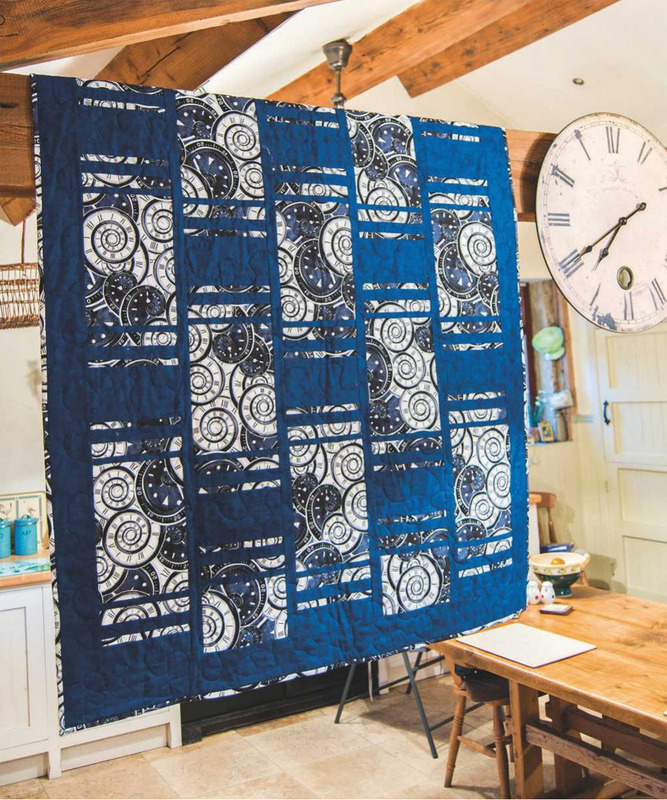 The quilt top comprises five columns separated by sashing strips. From left to right the columns are numbered 1–5; columns 1, 3 and 5 are identical, and columns 2 and 4 are identical. See Fig 1. 2. Each column requires one 7 1/2in wide feature fabric strip and one 7 1/2in wide contrast strip. The strips are crosscut to give the required patches. 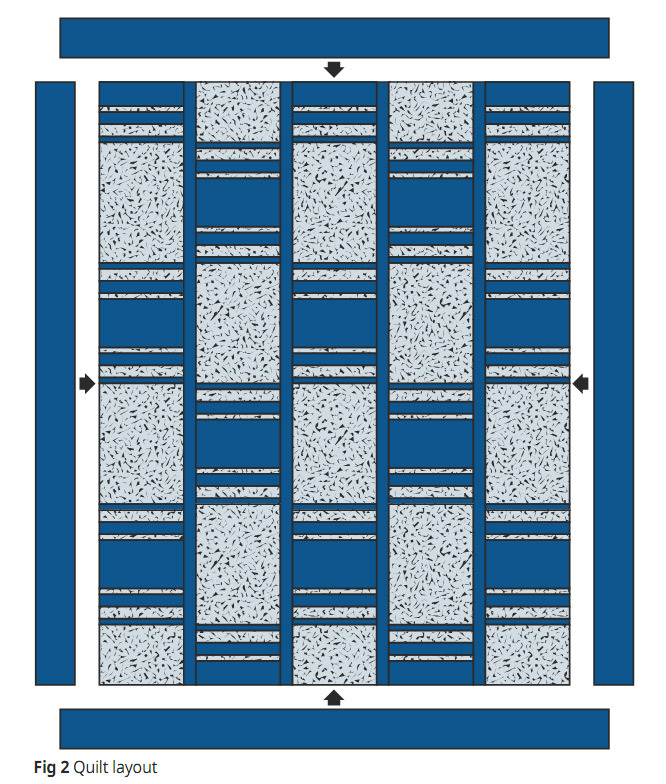 To ensure that the pattern of the print runs along the column, when crosscutting the feature fabric it’s important that you cut the patches in the order given in Steps 3 and 4. 3. To piece each of columns 1, 3 and 5, from top to bottom, crosscut the strips at the widths given (note: these are the cut widths) and then join in the following order: 2 1/2in contrast; 1in feature; 1 1/2in contrast; 1 1/2in feature; 1in contrast; 10 1/2in feature; 1in contrast; 1 1/2in feature; 1 1/2in contrast; 1in feature; 4 1/2in contrast; 1in feature; 1 1/2in contrast; 1 1/2in feature; 1in contrast; 10 1/2in feature; 1in contrast; 1 1/2in feature; 1 1/2in contrast; 1in feature; 4 1/2in contrast; 1in feature; 1 1/2in contrast; 1 1/2in feature; 1in contrast; 5 1/2in feature. The columns should measure 7 1/2 x 50 1/2in (unfinished). See Fig 1. 4. To piece each of columns 2 and 4, from top to bottom, crosscut the strips at the widths given (note: these are the cut widths) and then join in the following order: 5 1/2in feature; 1in contrast; 1 1/2in feature; 1 1/2in contrast; 1in feature; 4 1/2in contrast; 1in feature; 1 1/2in contrast; 1 1/2in feature; 1in contrast; 10 1/2in feature; 1in contrast; 1 1/2in feature; 1 1/2in contrast; 1in feature; 4 1/2in contrast; 1in feature; 1 1/2in contrast; 1 1/2in feature; 1in contrast; 10 1/2in feature; 1in contrast; 1 1/2in feature; 1 1/2in contrast; 1in feature; 2 1/2in contrast. The columns should measure 7 1/2 x 50 1/2in (unfinished). See Fig 1. - When joining the patches in the columns, press the seams to one side. Where you can, press the seam towards the darker fabric. When adding narrow strips you may need to press the seam towards the wider patch. - If you wish, as you work you could add a label to the top of each column; this should ensurethat you don’t get them muddledup and that you have them in the correct orientation for joining. 5. Join the 1 1/2in wide contrast fabric strips on their short ends to to create one length; if using straight seams you will need five strips but if you prefer to join with diagonal seams then you will need six strips. Crosscut to give four 1 1/2 x 50 1/2in sashing strips. 6. 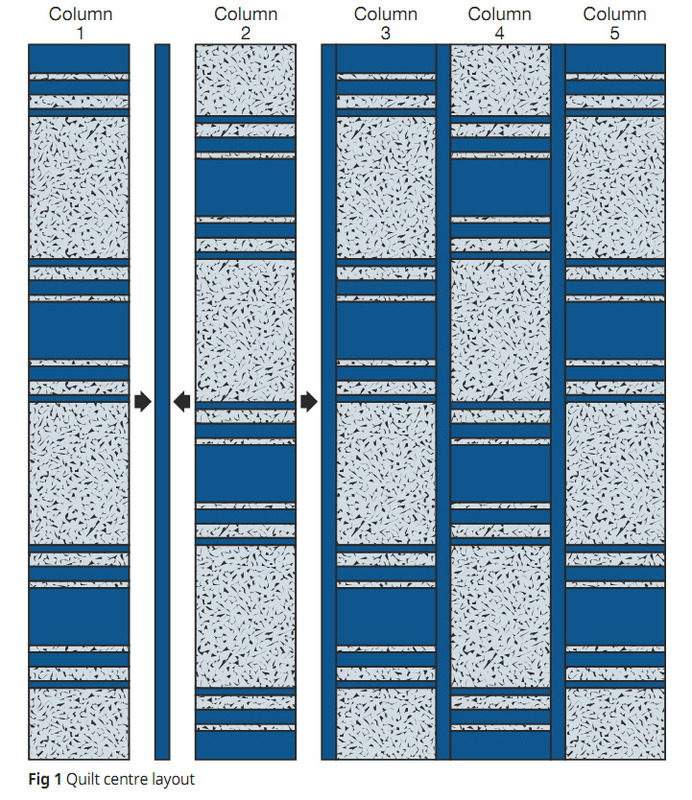 Making sure you have them in the correct order and orientation, join columns 1–5 with a sashing strip between them. This completes the quilt centre, which should measure 39 1/2 x 50 1/2in (unfinished). See Fig 1. 2. Join a 3 3/4 x 50 1/2in strip to each side of the quilt centre; press the seams outwards. 3. Join a 3 3/4 x 46in strip to the top and bottom of the quilt centre; press the seams outwards. This completes the quilt top, which should measure 46 x 57in (unfinished). 1. Give your quilt top and backing a good press. Layer the quilt by placing the backing fabric wrong side up on a clean flat surface, followed by the wadding and then the quilt top, centrally and right side up; the backing and wadding are slightly larger than the quilt top. Working from the centre outwards, pin with quilters’ safety pins or tack to secure. If you aren’t confident about the accuracy of your piecing and therefore the size of your quilt centre, before cutting your border strips you could measure your quilt top to determine the length of strips required. - Side border strips: Measure down the centre of the quilt from outer top edge to outer bottom edge and cut your side border strips to this length. - Top and bottom border strips: After adding the side borders, measure across the centre of the quilt from outer side edge to outer side edge and cut your border strips to this length. 2. Quilt as desired by hand or machine. You could use an all-over pattern as Sarah has, or perhaps you could quilt around the motifs of the feature fabric’s print. Whatever design you use, so that the quilt lies flat, try to have an even amount of stitching over the whole quilt surface. 3. When you have finished quilting, trim the excess backing and wadding level with the quilt top edges. 4. Join the 2 1/2in wide feature fabric strips with diagonal seams, pressing the seams open to reduce bulk. Trim away the ‘ears’ and fold the strip in half lengthwise, wrong sides together, and press. 5. Working from the right side and starting part way down one edge, match the raw edges of the binding to the raw edges of the quilt and sew in place, folding a mitre at each corner. Before completing your stitching, neaten the short raw end of the starting piece and insert the ending piece into it. Fold the binding over to the back of the quilt and neatly slipstitch in place by hand. 6. Add a label, including at least your name, location and the date the quilt was made.